Since the Aztecs had developed agriculture and a state society, I suppose we should be glad it wasn’t they who invented the 3-masted sailing ship. I have to imagine the amount of cultural self-flagellating we see and hear is unprecedented. Happy Thanksgiving. I have heard that the large sailing ships were invented in response to Viking depredations, though it seems like the necessities of Mediterranean trade may have encouraged their development, too. …don’t forget about the Knights of Columbus, too. …I agree on the former, but with the latter…I think a lot of people who denigrate Columbus do so because they *are* being overly literal about the holiday. …it’s like the 12th of July. Is celebrating the outcome of the Battle of the Boyne celebrating the fact that your guy won, enabling your group to keep your “religion…freedom and laws”? Or is it celebrating the fact that your guy won, enabling your ancestors, and now you, constantly to make “croppies lie down,” ensuring that they “shan’t have your liberty, do as ye will,” and making sure forever to keep “a foot on the necks of the croppy”? It’s…really both, and what any individual emphasizes depends on what most affects them. A Protestant would unsurprisingly focus on how desperate they were to survive, how they’d historically been massacred and persecuted, how their religion would now survive in their locality. A Catholic would equally unsurprisingly focus on how…desperate they were to survive, how they’d historically been massacred and persecuted, and how this Protestant victory led to their continued exclusion from full participation in their local society. I don’t remember ever noticing any particular message associated with Columbus Day other than sales at the mall. It’s kind of a meaningless holiday to most people, I think. I get misty-eyed on Armistice Day, thinking of all the poor folks who died in stupid stupid WWI battles, but Columbus Day is marked by white folks posting about what a terrible person Columbus was. I wouldn’t mind dropping CD from the roster, but I don’t want to replace it with something just as bad. I just finished reading some WWI history. The British fought the Turks for control of Basra, Aleppo, Homs and other cities currently in the news. It makes you wonder just how far a Cradle of Civilization can fall and how many battles can be fought over the same piece of ground. We must not forget though that the Aztecs were one of the most organized states in America. They even had universal education, which Europeans implemented centuries later and yet not consistently. They were culturally like ancient Egypt or Mesopotamia, but they were above all a war state, like Sparta or Japan. I believe if they weren’t outright conquered, but still had some long-term contact with Europeans to exchange goods and ideas, they would be the Japan of America today. I often wonder what would have happened had the Americas continued developing in isolation for a few thousand years more before meeting the Europeans. The Aztecs are still around, but not doing a whole lot, tech-wise. I don’t think we can just blame that on them having been conquered, because Japan also got conquered. If you mean the events after WW2, then it is a very different scenario. Japan up to then had already been much advanced, even more than many western countries, also had a very large population base and didn’t have to battle the diseases american Indians faced. ON the other hand, from a population of 12 million in the Valey of Mexico, just 2 remained after the conquest, and mostly impoverished. Most of the nobble class, which drove most of the cultural development, were either killed or found themselves in poverty, dispossessed of their lands, and the lowly peasants just continued working for different but similar masters. Also, it is probable that many peoples of different backgrounds were mixed up in this conditions. And of course some centuries later, most of the Indians got mixed up with the Spaniards, so in sense they ceased to exist as a nation. 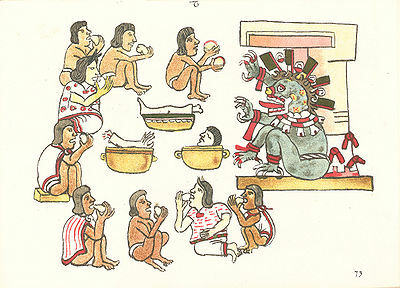 There are modern nahuatl speakers today, if you mean about those, but they are few in number and disjointed. And we even cannot assertain if they are the descendants of the original Aztecs because nahuatl was a lingua franca for some time there. But the nahuatl they speak today is in most dialects a creolized and impoverished form, not the cultivated classical nahuatl of the period around the conquest. While the modern “pure” indigenous population of Mexico is indeed small, the majority of Mexico’s 120 million people are have mixed Euro/Indian ancestry. Wikipedia estimates the current white population at 9-16%, with whites comprising no more than 20% of the historical population. I think the indigenous peoples of Mexico have fared better, overall, than those of the US (compare the far smaller % of the US population that has any Indian ancestry.) So, yes, there are very few “Aztecs” around anymore, but unless they were disproportionately slaughtered compared to other indigenous populations or have been particularly isolated (totally possible, I guess,) they probably have quite a few descendants. Still, their organized culture got wiped out. We’ll never know what they would have done on their own. Following the late Marvin Harris* Atztecs were cannibals as their crops didn’t supply them with enough high value proteins and most animals suitable for husbandry were hunted to extinction by their forefathers. BTW: Thx for xour great work!